Stand For Trees: Forest Carbon For The Masses? High-profile corporates like Disney and Microsoft have traditionally been among the leading buyers of carbon offsets that save endangered rainforest, but a new initiative is betting that these offsets with their unique, compelling stories will resonate with individuals as well. 10 February 2015 | Forest carbon has always been a touchy-feely way to reduce your carbon footprint after all, by purchasing a REDD offset, you’re doing more than just fulfilling the requirement of the acronym and “Reducing Emissions from Deforestation and forestDegradation.” If the project is properly-structured, you’re helping a specific community save a specific patch of endangered rainforest and in a way that often helps them build schools, fund healthcare, and develop sustainable sources of income for the future. 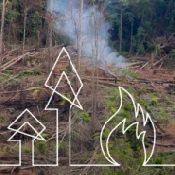 These features could make REDD offsets ideal for individuals the millions of people around the world who want to be carbon-neutral but don’t know how to offset the few tons of emissions they inevitably generate. The overwhelming majority of REDD offsets, however, are purchased by corporations. Today, the Code REDD consortium announced a new initiative called”Stand For Trees“, which aims to change that by using social media and crowd-funding to tell the stories of individual REDD projects and make it easier than ever for individuals to make direct purchases. The site, www.standfortrees.org, was created with funding from the U.S. Agency for International Development (USAID), and is mobile-enabled. The site offers short summaries of each project, and makes it possible to purchase in quantities as low as a half-tonne. (For reference, the average American household emits about 7 tonnes of carbon dioxide per year.) For now, the site only lists projects that have been dual-certified by both the Verified Carbon Standard and the Climate Community and Biodiversity Alliance, but the palette may be expanded to include projects certified under other standards as well. The credits are registered on the world’s largest environmental registry services provider, Markit. For project developers, the program offers higher payouts than they would generally receive in the wholesale market and also a higher profile. The offsets on Stand for Trees are priced at $10 each, with the projects themselves receiving nearly $9 of that. Code REDD charges a 75-cent per tonne administrative fee, and the Markit registry charges an additional 2 cents to track the offsets. On top of that, there’s a 2.9% sales fee and a transaction fee of 30 cents per transaction regardless of size.